The systemic veins receive deoxygenated blood from capillaries and return the blood to the heart. Ultimately, all systemic veins merge to form two major veins, the superior and inferior venae cavae, that empty into the right atrium of the heart. As shown in figure 12.21, superficial areas of the head and neck are drained by the left and right external jugular veins, which lead into the left and right subclavian veins, respectively. The left and right vertebral veins carry blood from the cervical spinal cord and deep neck regions into the subclavian veins as well. 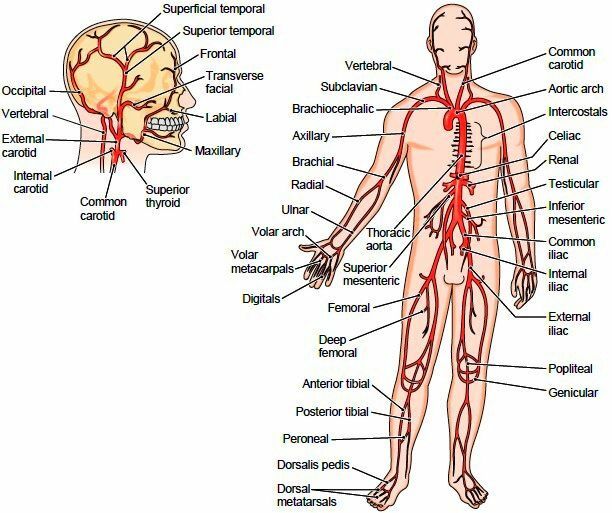 Most of the blood from the brain, face, and neck is carried by the left and right internal jugular veins. Each internal jugular vein merges with a subclavian vein to form a brachiocephalic vein. The left and right brachiocephalic veins join to form the superior vena cava, which returns blood to the right atrium of the heart (table 12.6). Deep regions of the forearm are drained by the radial and ulnar veins. These two veins join at the elbow to form the brachial vein, which drains the deep areas of the arm (figure 12.22). Superficial regions of the hand, forearm, and arm are drained by the laterally located cephalic (se-fal’-ik) vein and the medially located basilic (bah-sil’-ik) vein. Note the median cubital (kyu-bi-tal) vein, which connects the basilic and cephalic veins. The basilic and brachial veins merge in the axilla to form the axillary vein, which, in turn, joins with the cephalic vein to form the subclavian vein. As noted earlier, the subclavian vein joins with the internal jugular vein to form the brachiocephalic vein (table 12.6). The anterior and posterior tibial veins drain the foot and deep regions of the leg. They join inferior to the knee to form the popliteal vein. The small saphenous (sah-fe’-nus) vein drains the superficial posterior part of the leg and merges with the popliteal vein. The fibular vein drains the lateral portion of the leg and joins with the popliteal vein at the knee to form the femoral vein, which drains the deep regions of the thigh and hip. The great saphenous vein originates from the venous arches in the foot, and it drains the medial and superficial portions of the foot, leg, and thigh. It merges with the femoral vein to form the external iliac vein. The external iliac vein and the internal iliac vein receive branches that drain the superior thigh and pelvic areas, and they merge to form the common iliac vein. The left and right common iliac veins merge to form the inferior vena cava, which returns blood to the right atrium of the heart (see figure 12.22). The azygos vein drains most of the thoracic and abdominal walls, and it empties into the superior vena cava near the right atrium. The azygos vein receives blood from a number of smaller veins, including the posterior intercostal veins and the ascending lumbar vein, which drains the wall of the abdomen (figure 12.23). The hepatic portal vein carries blood from the stomach, intestines, spleen, and pancreas to the liver instead of the inferior vena cava. The hepatic portal vein is formed by the union of the superior mesenteric vein, which drains the small intestine and proximal large intestine, and the splenic vein, which drains the spleen. The splenic vein receives blood from the inferior mesenteric vein, which drains the distal large intestine, and the pancreatic vein, which drains the pancreas. The gastric veins, from the stomach, drain directly into the hepatic portal vein. All of these veins compose the hepatic portal system. After entering the liver, the blood flows through the venous sinusoids, where materials are either removed or added before the blood enters the hepatic veins, which empty into the inferior vena cava (figure 12.24a). Note that 75% of the blood supply to the liver comes from the hepatic portal vein; the rest comes from the hepatic artery proper (see figure 12.18a). The hepatic portal system allows the liver to monitor and adjust the concentrations of substances in blood coming from the digestive tract before it enters the general circulation. The left and right renal veins carry blood from the kidneys, and the left and right ovarian or testicular veins return blood from the ovaries in females or the testes in males, respectively. Both renal veins and the right ovarian or testicular vein drain into the inferior vena cava. The left ovarian or testicular vein empties into the left renal vein.